Volume: 25 x 13cm. Fits passports, tickets, credit cards, pens, etc. Ticket and passport sleeve. Removable wrist strap. Colours: Charcoal Distress or Navy Distress. 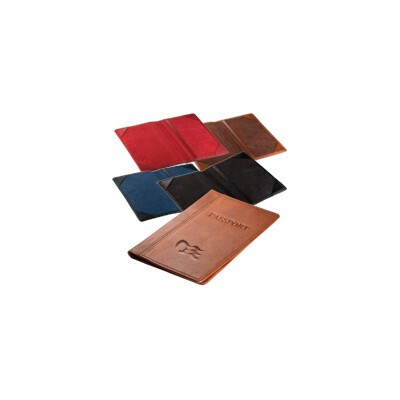 Details: Document wallet also available in Navy Distress colour. Dimensions: 25 x 13cm. Colour: Charcoal Distress. Description: Manufactured in imitation leather with peach skin interior. Features: Packaging: Polybag. Colour: Black Material: Immitation Leather Product Size: 240mm(h) x 130mm(w). Freight details : 50 per carton, 11.5kgs, 60 x 31 x 29cms; Decoration Type(s): Colour Print / Deboss / Debossed Foil / Foil Stamp / Full Colour Print . Decoration Area: Print: 70mm(w) x 120mm(h). Description: Identify your delegates easily with the smart and functional Platform Neck Wallet, including pen and belt loop for their convenience.. Zippered main compartment | Clear vinyl ID window | Slip pocket on back | Elastic pen and belt loops | 600D polyester with PVC backing | Neck rope with toggle. Size: 14cm w x 18cm h,11.7cm w x 8.6cm h (window size). Colours: Black. Decoration Areas: Supacolour | Screen Print. 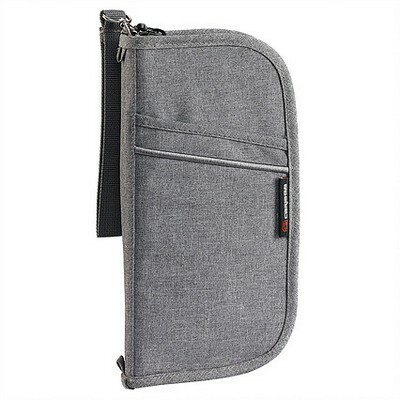 Description: Made from stylish grey polyester with PVC trim and white stitching, internal credit card slots, document and passport pocket and pen loop. Features: Packaging: Polybag. Colour: Grey/Black Material: Polyester, PVC trim Product Size: 135mm(w) x 215mm(h) x 15mm(d). Freight details : 100 per carton, 13kgs, 46.5 x 58 x 27cms; Decoration Type(s): Colour Print / Full Colour Print . Decoration Area: 60mm(w) x 60mm(h). soft leather look finish (embossable). RFID protective lining. 6 x credit card slots. centre pocket for notes. size 10.5 x 8.2 cm. soft leather look finish (embossable). RFID protective lining. multiple card pockets. gusseted itinerary pocket. internal zip pocket. pen loop. size 24.5 x 12.5 cm. Description: Made from smooth PVC and soft nylon lining. Internal pockets for passport and separate card slots. Features: Packaging: Polybag. Colour: Black Material: PVC Product Size: 105mm(w) x 145mm(h) x 16mm(d). Freight details : 200 per carton, 16kgs, 73.5 x 27 x 38.5cms; Decoration Type(s): Colour Print / Deboss / Foil Stamp / Full Colour Print . Decoration Area: 55mm(w) x 55mm(h). Description: The ultimate travel companion. This versatile passport wallet comes with a built in 4000mAh lithium polymer battery to charge your devices on the go. Features: Also supplied with a charging cable to charge most phones and tablets, and battery capacity display on the back. Pen & USB''s not included. Supplied in a black tuck box. Packaging: In a polybag and presented in a black tuck box. Packaging size 210mm(h) x 146mm(w) x 25mm(d). Colour: Black Material: Product Size: 210mm(h) x 135mm(w) x 20mm(d). Freight details : 20 per carton, 7kgs, 31 x 27.5 x 23cms; Decoration Type(s): Colour Print / Deboss / Foil Stamp / Full Colour Print . Decoration Area: 60mm(w) x 80mm(h). Description: Ideal for tour groups and conference groups, the Bonded Leather Travel Wallet is smart and functional, featuring scalloped panels.. Bonded leather | Quality silver zip puller | Elasticised mesh pocket inside | Elasticised loop for pen | Business card holders | Scalloped feature panel front and back of spine. Size: 13cm w x 24.5cm h x 3cm d. Colours: Black. Decoration Areas: Screen Print.